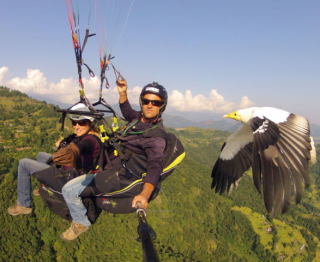 Parahawking is coming to the U.S. after originating in Pokhara, Nepal. 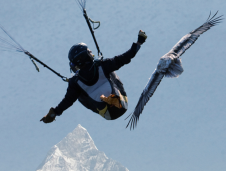 As a new adventure sport, it’s an activity that combines the best of two worlds, namely paragliding and falconry -- where the birds of prey could be vultures, kites, eagles or Harris's hawks. Developed by British falconer Scott Mason in 2001, the idea first came to him after taking to the skies with British paraglider Adam Hill. From that first encounter, they then teamed up to train black kites and Egyptian vultures — working only with rescued birds, versus birds of the wild. Mason and Hill have since documented their endeavors, with an assist from colleague Graham Saunders-Griffiths, in an awarding winning film entitled Parahawking. Flying with a Harris’s Hawk named, “Shanti,” this American team taught her how to parahawk for the very first time. Since that maiden voyage, “Shanti is now a ‘veteran’ and has been featured on Animal Planet, the BBC and the Travel Channel,” notes Russman. “Parahawking in the United States is not currently available to the general public, though hopefully this will change in the very near future,” adds Russman. Over the last decade, Phil’s had an illustrious career with work that included working William Shatner of ‘Star Trek’ fame to produce Risk and Reward. This 70-minute instructional DVD revealed the risks in PPG and how to overcome them. Phil actually had the privilege of flying in formation with Captain Kirk. "But that's a story for another time!" Lite Touch Films is known around the world in the paragliding and powered paragliding communities. The company is actively involved in journalism, producing training materials, and providing instruction, equipment sales and advice to individual pilots, new and experienced. Russman suggests that if interested, and while waiting for schools to start offering instruction in parahawking, folks can sign up for an hawk encounter or falconry classes at Sky Falconry, located near San Diego, California. I know that's one for my bucket list -- how about you? Even Ducks Need Some Fun! The Sliding Animal Video of the Day!! !